"The introduction of the railways has greatly changed the character of these old inns. 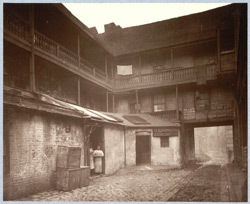 The 'George' alone seems now to do any considerable business in the 'receipt of travellers'; in other cases the business of a tavern has superseded that of an inn, and the great courtyards are either being gradually encroached on by warehouses, or have been taken up by railway companies as receiving offices." The White Hart is referred to in Shakespeare's Henry VI and Dickens's Pickwick Papers. The photograph shows the yard nearest to the street.